eyesitemd.com - Richard Jones, M.D. 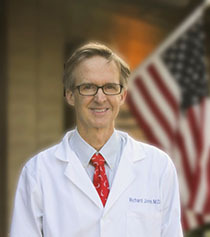 Richard A Jones MD is a Board Certified Ophthalmologist. He graduated from the University of California, Davis with highest honors then finished his medical degree from the University of Texas Medical Branch where he was a member of Alpha Omega Alpha, the Medical Honors Society in the top 1% of his class. He served an internship in general Surgery at the University of Arizona and performed his residency in ophthalmology at the University of Texas. He has been Chief of the Department of Ophthalmology at Mercy General and Sutter General Hospitals. He currently is Medical Director of Capital City Surgery Center. Dr Jones was named twice in “Best Doctors in Sacramento” by his peers published in Sacramento Magazine. He has been program director and president of Northern California's Alta Ophthalmologic Society. He is a member of the California Academy of Ophthalmology, fellow in the American Academy of Ophthalmology, American Society of Cataract and Refractive Surgery, and member of the California Medical Association and American Medical Association. Dr Jones is past President of the Sierra Sacramento Medical Society composed of over 1600 physicians dedicated to health outreach and advocacy for Sacramento's 1.7 million residents. He is active with the California Medical Association leadership, serving as delegate and committee member helping to determine health care policy for 36 million Californians. Dr. Jones speaks for numerous professional and patient organizations and has served as associate medical director for Vision Service Plan and as participant with the Sacramento Blood Source Foundation. He has volunteered overseas with the International Eye Foundation and he is a participant with the Medical Society SPIRIT program, providing free eye surgical care restoring eyesight to uninsured, indigent citizens of the community. Dr Jones is an avid bicyclist and has traveled several times to ride parts of the Tour De France. He likes technology and computers (when they work!) He and his wife enjoy traveling internationally, hiking and skiing. He has had the distinction of working with his highly regarded predecessors Dr. William Kohl, Dr. Norman Schwilk, Dr. Randal Childers and, Dr. Richard Zipf. Dr. Jones is currently honored to work with his current partner Dr. Christian Serdahl and in association with Dr. Michael Schermer.